7.52 points at 23 votes (rank 194). As super agent you drive for your life in a turbo-charged car that is equipped with the most current weapon technology. The street is full of hostile agents, that have nothing else in mind than to atomise you and your engineering marvel. Manoeuvre your car at highest speed and with all your abilites, but watch out for the "Road Lord", the "Switch Blade", the "Enforcer" and the other hostile agents that will try to hold you back on land and water. You have to destroy them before they eliminate you. A very detailed, almost exact 1:1 conversion of the popular arcade original. 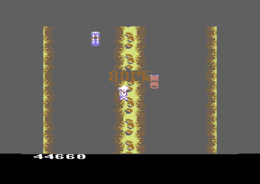 This comprises the level build-up, the graphics and also the FX. It is very interesting how the controls were implemented, you can use the second joystick in port 2 to fire the rearward weapon. For this game one should use a "Dual Control Modul" (a holding in which two joysticks are held together), as the fire buttons of both joysticks are needed to play. The movement of the car is controlled by the joystick in port#1, the joystick in port#2 only provides for the second firebutton. Both buttons are used to trigger weapons. 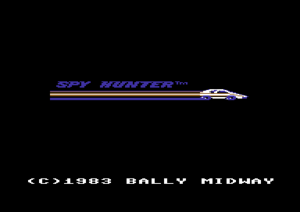 The game starts with a transporter appearing at the lower border of the screen. It will drive to the roadside and unload your agent car which is equipped with a machine gun. From now on you can steer the car. 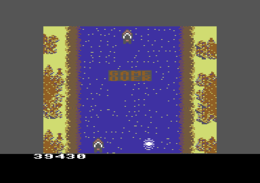 The terrain changes in the course of the game, both the colour and the ground. In a later section you will reach a river. Here you drive your car into a boathouse, there it will automatically change to a water compliant amphibian vehicle. You will also meet bridges and icy tracks. Each time a new section of the track starts, i.e. when the terrain changes, the transporter appears at the roadside. To get access to new weapons you need to connect to the transporter. For this you need to let the transporter pass and when you are behind it drive into it from the rear. After the installation of a new weapon your car will roll out again. Available weapons are shown at the lower right of the screen. With the fire button of the joystick in port#1 you can fire machine guns or missiles and with the fire button of the joystick in port#2 smoke or oil. But you can also use your car to ram enemies and thus push them off the street. You will meet different types. Each one, except for the Road-Lord has its unique weapon. If you go off the road or drive into an obstacle, this will cost you one agent vehicle. The current score is shown at the lower rim of the screen. 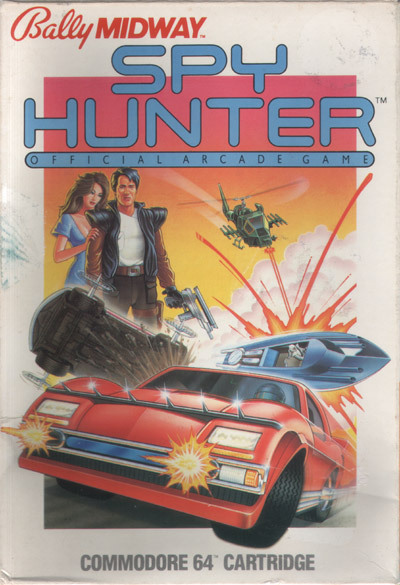 The current highscore is shown in the menu screen. Each time you get into the boat house (no matter if from water or land) you get 1500 points. The machine gun that belongs to the standard equipment can only be used against enemies in front of you, therefore you should additionally get oil or smoke bombs as fast as possible. Also missiles are important, as these can be used very well against the helicopter. H.T.W: "I have seldom seen such an exact and well playable conversion of an arcade classic. In those days I even screwed the joysticks together. Unbelievable, what things one gets up to...".